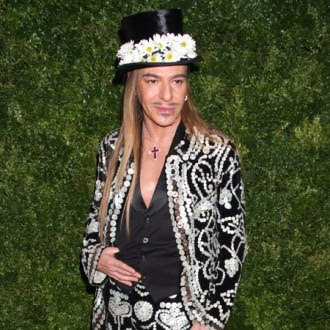 Fashion CRIME: Galliano's Anti-Semitic Fauxpas..
John Galliano, a world renowned fashion designer and icon, was recently suspended by designer label, Christian Dior, after an incident in a Paris cafe, ending in Anti-Semitic racial slurs. The designer, benched from his job at Dior after being arrested for admitting his "love" for Adolf Hitler to a couple within a Paris cafe. French laws as well as Dior's fashion laws have a strict ZERO toleration for any hate crimes. Galliano is one for the theatrics, but in this case I have to agree with Dior on this on. I am glad to see that regardless of his rank within the fashion industry, there are consequences for incidents like this one in particular. Previous to the night this all went down, he was preparing for his fall/winter 2011 RTW collection. In the end Galliano ends up with a bad name, suspended job, as well as facing up to possibly 6 months jail time, and a $43, 000 fine! His words in regard to the event, "Anti-Semitism and racism have no part in our society. I unreservedly apologize for my behavior in causing any offense. "I was subjected to verbal harassment and an unprovoked assault when an individual tried to hit me with a chair having taken violent exception to my look and my clothing. "For these reasons I have commenced proceedings for defamation and the threats made against me." Regarless of what went down, you never low blow anyone based on racial slurs. Makes you think twice about what many designers have to say behind closed doors! What do you think fashion lovers?